Allwinner A20 dual core Cortex A7 processor was/is one of the most popular Allwinner SoCs thanks to its low cost, the availability of interfaces such as SATA, Gigabit Ethernet, HDMI 1.4, and multimedia support with H.264 encoding and decoding. The company has now introduced new processors that build upon A20, but working in industrial and military temperature ranges, and compliant with various standards (TBD). Again A60i is the industrial grade SKU, and A60pro the military version. 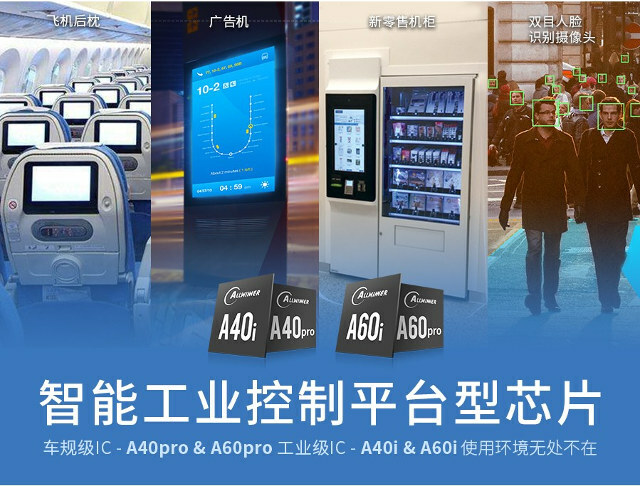 The processors should be used in the aerospace industry for infotainment, retail industry for digital signage and vending machines, security applications like face detection, and so on. I’ve been informed all A-series processors have a 10-year life cycle. Software (SDK) provided by Allwinner might be different than for Allwinner A20, as I’ve been told the automotive business unit (BU4) is in charge of those new processors, while processors like A20 or A33 for consumer goods are managed by BU2. Still outdated Mali. The SDK kernel is probably 2.6 or some other prehistoric version? Very likely an unmaintained kernel full of thousands of exploitable vulnerabilities at least, which is scary to put in automotive environments. But we could be wrong, maybe they picked 4.4 and intend to rely on the CIP kernel. Their latest BSP code drops (for the H series) rely on either kernel 4.4 or 4.9. Web search for ‘allwinner homlet github’ is sufficient. There is a BSP with kernel 4.4 for A64. I am experimenting with one on my old BPI-M64. I run the kernel 4.4 passing a DTB from u-boot, works very smooth but as in kernel 3.10 some work is needed on ethernet / eMMC side that is specific to the board. I think the hack I did one year ago would work on 4.4 too. But kernel 4.4 is more complex than 3.10 and i would think an AW engineer / kernel developer would fix up this in a very short time. Based on this little experience I think they will be using kernel 4.4 for the new processors. > Based on this little experience I think they will be using kernel 4.4 for the new processors. Why? As already said: Do a simple web search for ‘allwinner homlet github’. AW moved on to 4.9 with H6 and A63 already. Maybe they forward-ported their drivers even to 4.14 in the meantime? But as you say there is kernel 4.9 for A63 there would be no reason to use 4.4.
and Not to mention “Industrial & Military Grade” needs a stable kernel version. Temperature grades need a kernel version and software support? This makes perfectly sense. AW now can sell their outdated chips for 3 to 10 times of the original price. However, at least military will demand complete open source. So this is a win for AW, for industrial and military customers (as they still are significantly cheaper than other chips) an for the open source community. BTW, Cortex A7 is still one of the most power efficient chips. Huh? These are NEW chips. It’s not like they’ve taken an old part and renamed them, as none of the current chips have the same features as these. They still have to pay licences to ARM, although possibly cheaper licenses than for a Cortex-A53 or similar and the same goes for the GPU. So no, they make no sense at all. If the military specification chips are destined for autonomous weapons (viz killer robots), which may end up being destroyed, then it makes perfect sense to use the chip version which will be at minimal cost and not a more expensive over-specified processor. Remember, autonomous robots make sense — your own soldiers do not get killed, just the soldiers and civilians of the enemy, which is why “let’s make America great again” must have them and use them. It’s all about temperature grades when ‘miitary’ is mentioned. is there any reason for them to avoid using A55 low power ones, or even A53? Cortex A7 cores must still be cheaper, and do the job for the type of applications they plan to use those on. If these SoCs are really derived from A20 and use all the rather outdated IP blocks then they could run with mainline kernel pretty soon (thanks to linux-sunxi community). But looking at specs at least A40 seems more like R40 plus two more USB2 host ports. Who knows? Who cares? If they target support by the CIP kernel through all the work the sunxi community has done, it can make sense to stick to A7, as the only two supported platforms for now are x86_64 and arm (32 bit). Anyway, right now we may find it stupid to use A7 over A53, but in 8 years A53 will look stupid as well, and if the chip is really supported for a long time, it will continue to ship. Why would someone with a critical system, partner with a company known for failed software support? Cheap chip, nightmare support costs? Point me to other vendor with better mainline support in their product range. Only Sunxi and now Rockchip have so good mainline support. And because of that, allwinner has a good BSP support both in uboot and kernel. They even provide meta layers for Yocto and BSP support for buildroot. Right now, Sunxi and Rockchip are really hot. NXP? Yes, that one has one of the worst mainline support. No imx6 BSP has got in the mainline and it’s really a mess to develop on imx compared to mainline support BSPs. So its not allwinner’s merit their SOCs are well supported by mainline, but the community’s. It’s a pity Bootlin had to go to Kickstarter to collect 30k€ instead of Allwinner paying the bill. As far as I know both Rockchip as well as amlogic are at least somewhat supporting mainlining efforts. But I’m just not aware of any really well (manufacturer-) supported SOC. Allwinner uses sunxi’s cores. The support in the mainline is not from allwinner and also the BSP support comes from the community. The support for Rockchip comes mostly from Theobroma, I believe. Also bootlin pushes a lot of stuff for the BSP support in buildroot. Nevertheless, the point is that no matter where the support comes from, allwinner has a great support in the mainline. You can build you custom kernels easily and even use the preempt-rt devel branch and have a kernel with BSP support for several boards from nanopi or orangepi in a few minutes. Why is it that qualcomm’s socs never mentioned when baseline support needed? I think most probably because you can’t find board with $10 with a Qualcomm CPU. I wouldnt have the courage to build something based on these allwinner/rockchip socs, sorry. I don’t understand what you mean here. Does the processor has a flow or a h/w bug or there is something wrong with the design and the board implementation of the boards you’re talking about? I have a banana pi M1 running my single SATA disk NAS for the last 4 years. Is working 24/7 and the uptime is more than a year every time. Works great. I have used several orangepi and nanopi boards for various tasks, like soft-synths running RT kernel, dev boards using usb-agent to boot other devices and even flow meters and weather station running 24/7 and many other projects with custom bootloader and kernels and never had issues. Therefore, I don’t know why people hate them, but I’ve done so many things with those cheap boards and always get the best results. If you need raw power then H2-3-4-5 do not fit the purpose, you need to go with rk33xx, tegra or x86, but anything else below that I really can’t find a match for the price and the product range. People dislike the Chinese SOC boards because in general it is much easier to get five different OSes running on a Raspberry Pi. Problems happen when in-experienced people get an OrangePi because it is $5 cheaper than a Raspberry Pi. I will say the Chinese SOC manufacturers contribute a great deal to this problem by not keeping their Android and Linux BSP up to date and on public servers. I find it ridiculous that I have to get my Chinese board maker to sign up with Allwinner for a tech support account and then funnel all of my software issues through them. A much smarter strategy is for Allwinner to make everything public and then have two support tiers. A private one for their big accounts and a public forum where people can post and Allwinner employees answer in their spare time. A huge problem is created by the Chinese SOC companies not making a unified Android BSP that covers all of their CPUs in a single package. Allwinner splitting its software support into the various business units is insane. It is crazy for each business unit to put out their own BSPs. I can’t tell about Android as it’s not my field of expertise, but regarding Linux support and BSP support via Yocto and buildroot, currently the Sunxi (and also allwinner) support is excellent. Everything is open source and anyone can branch the BSP and then push commits. There’s a repo for the ATF and uboot and Linux are mainline, no need for branches or vendor kernels. At the same time, Sunxi is also active in pushing stuff (e.g. the meta-sunxi). Personally, I haven’t seen so active support from the community and the vendor to support a range of different boards based, especially on H3 and H5. Nvidia has the worst support ever but everyone complaints about Sunxi. TK1 is a beast and is running 3.10.40 full of bugs, broken device-tree, no support and people struggling in the forums to just bring up interfaces. I assume that probably has to do with luck of experience for most of the people. Having worked with dozens of different boards and vendors the last uears, working with Sunxi during the last year feels like peace of cake. You are not trying to use the Allwinner camera and video encoders. And likely not the video decoder either. Mali drivers for all allwinner SOCs are now available and also VPU support in the mainline will be available in the near future by bootlin. Seems you’re only focused on Allwinner SoCs that are 4 years or even older? I’m not focus on Sunxi CPUs. My main daily focus is on tegra, x86 and recently rk3399. But what’s the point of this anyway? The point is about Allwinner always shipping way outdated BSPs without ever making any effort to get their CPUs supported in mainline. The “sunxi” you’re talking about is not a vendor, it’s a community of enthousiasts which buy new boards, reverse-engineer them, document them and write drivers to be merged into mainline. Some companies (like bootlin) have to go through kickstarter to sponsor a driver development. All this could and should be done very inexpensively by Allwinner themselves. I’d argue that without sunxi, you wouldn’t find Allwinner chips on SBCs anymore, you would only find it in highly outdated and vulnerable Android tablets like the one I bought based on kernel 3.4.39 which doens’t take upgrades. *This* is the point a few participants above tried to make. OK, I get the blaming allwinner part for not trying to add their SOCs in mainline. But blaming the BSPs all together doesn’t make sense because they do have great support in he mainline, even if a community does that. These are great boards for several projects using mainline and build custom distributions. Anyway, I get the sense that is more like a hate thing for allwinner altogether, which I don’t care really. I enjoy build stuff with those boards and find it very easy to do and I commented on the first place, because it’s inaccurate to say that there’s no mainline support for these boards. You use the term ‘BSP’ differently than those people familiar with Allwinner do. Allwinner’s BSPs are usually just one giant code drop (depending on the business unit in question you end up with giant tarballs or github repos with one single commit and no history whatsoever) consisting of either a horribly outdated kernel or a somewhat recent kernel with their drivers forward-ported (a diff to relevant official LTS kernel version is always scary). Some functionality (e.g. sleep/standby) also relies on their own u-boot version, some blobs and code running inside the ARISC ‘management core’ contained in the SoCs (not documented, no sources). That being said: since community is doing all the relevant work (mainline stuff) and Allwinner pretty much does not care about quality or contents of their BSP it always takes an awful lot of time for full software support arriving upstream. That’s why you’re most probably only using really old Allwinner SoCs since software support situation in 2018 is only ‘great’ when looking at A10, A20, A13 and A33 (the latter being the youngest SoC here and just 4 years old). If these two new SoCs that are of no interest to any of the commenters so far anyway (since targeting industrial customers) will really be based on A20 and re-using all those old IP blocks then situation could’ve changed and A40/A60 run pretty soon with mainline (since everything A20 + different DT stuff would be all that’s needed). But I highly doubt this and believe mentioning of A20 is marketing and not related to any technical details. Maybe I need to clarify that when I mention BSP, I mean the board support package in the mainline u-boot and kernel. For example when you have a nanopi-neo2 board the BSP support in the kernel comes with the sun50-h5-nanopi-neo2.dts (and of course the kernel support for this DTS). The A10 and other relative series are “old”, sure. But what “old” means anyway? Also, when I’ve written great support I had the Hx series in my mind. Even the new H6 has a very active integration in the kernel and soon there will be also BSP support for the new H6 boards. Finally, regarding this A20 implementation I can’t comment if I don’t evaluate it first. This is hardly unique to AllWinner and Rockchip, most chip companies are the same and it’s frustrating beyond belief. Most things are based on ARM or possibly MIPS, so what is there to hide? AllWinner’s BU’s is another insane way of doing things and it’s a company that’s not easy to talk to and they show zero interest in you. I’ve been to their office in Shenzhen and compared to Rockchip, it felt like a total waste of time talking to them. Not that MTK or Realtek are much better… Marvell, ha, good luck unless you’re a multi-million dollar company. For Allwinner that is a foolish strategy. Allwinner would be 10x better off with a maximize sales strategy. US semiconductor companies are lucky that Allwinner is royally screwing up their software, if they has their act together on software there would be a bunch of dead US chip makers. And it is not like a hundred people haven’t told Allwinner exactly what they need to do to fix their software strategy. It is 100% within Allwinner’s ability to execute on these suggestions too. But until they see the light they will stay a Tier 2/3 chip maker. Here is a simple observation on Allwinner. All of their success is from Chinese manufacturers mass producing reference designs. How many non-reference design, successful products are there? That is where Allwinner is failing. This lack of openness and cooperation pretty much ensures that non-reference design products will fail. I’ve got a couple of attempts under my belt in that category. In my opinion, they don’t understand how important these non-reference design companies are to future growth. They are the seeds that may turn into oak trees. They look at today’s small company and say no revenue, what they miss is that places like Amazon gobble up these small companies. I’m with you 100% here. It really makes no sense at all, but this seems to be the mentality behind their reasoning, as I can’t see any other reason for it, unless they’re just plain simply lazy. I’ve got a couple of fairly successful projects done with AllWinner, but not relying on anything fancy like graphics or video, so that’s most likely why. Then again, they’re not alone when it comes to under delivering on drivers. Worst project ever was a router based on a Cortina Systems (now part of Realtek) SoC. They promised a new 3.x kernel, then told us it was impossible to update from 2.9.x and none of their other customers were doing this. That’s what you want to hear a year into a project, no? nVidia is the same also. Really bad support for their SKUs. This is why after the TK1 they changed their business model and only sell the TX1/2 board as it is and not the CPU. I’ve spend days in their datasheets to bring up interfaces that they even weren’t implemented. And they never did. But at least there was a datasheet, I can give them that, OK. The only way for smaller companies to get good support is to buy modules like Qseven and get support from the manufacturer. Even for a few hundred pieces you can get a decent support. Price is higher as mentioned by Dim, and in the past if was close to impossible to get datasheet or technical reference manual for a Qualcomm processor. This has changed though for their “E” processors like Snapdragon 410E. Documentation is not quite at the level provided by NXP however (just judged by the number of pages for the TRM: 303 vs 6,000+). These chips are for outdoor use. They are not normal consumer chips. This is the typical temperature range, don’t know if Allwinner followed this. I tried putting one of my consumer Allwinner devices in the garage where it could freeze, and it stopped working around -2°C. I suspect these chips will end up in car entertainment systems. People drive cars in Alaska and the desert where they will experience these temperature extremes. The Allwinner software I have seen can not identify any specific faces. That demo picture in the post is counting the generic faces it sees walking by. It is for retailers who what to know how many people pass by their store front. Faces are the easiest thing to count in a passing crowd. Actual face identification is typically done by passing the image into the cloud where much larger machines and databases can work on it. Hope they are better at it than UK Police! Just in case some people wondered (and it was not obvious from the peripherals list), Allwinner A40 & A60 processors are not pin-to-pin compatible with Allwinner A20. It seems the Allwinner page you quoted either contains a typo wrt ‘4x USB 2.0 (3x host interfaces, 1x OTG interface)’ (since how/why should a pin compatible SoC have one more USB2 host port without exposing it?) or there are really additional USB2 data lines exposed that need adjustments to existing PCBs. Anyway: if A40i is essentially the same as R40 and V40 then it’s time to move on to something less boring.